Brand spank'n new Exide golf cart batteries are put in all the refurbished golf carts at Affordable Golf Carts including my new used golf cart. Consider using these golf cart batteries when it comes time to replace your batteries. Dean, my friend from Affordable Golf Carts only uses Exide batteries for all of their refurbished golf carts. He feels that they are the most problem free golf cart battery and provide the longest battery life. According to the Exide website, their batteries use "thicker plates to improve cycle life and the heat sealed container reduces leaks. Heavy-duty construction helps to extend life and reduce water loss. 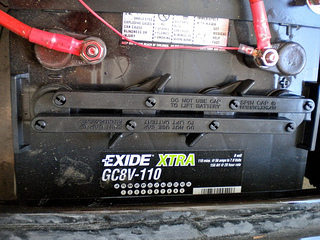 The most common voltage for an Exide deep cycle battery is either a 6 volt or an 8 volt. They are sold usually in sets of 6 (6 volts) for 36 volts or 6 (8 volts) for 48 volts. How do you know if you have 36 volt or 48 volt system? It's really quite easy. Look at the number of cells or holes where you water your batteries. Three cells means you have a 6 volt battery - 6 X 6 = 36. And 4 cells or holes means you have an 8 volt deep cycle battery. 6 X 8 = 48 volt system. Exide uses what is called a speed release for their vent caps. Just one turn and you can quickly check your water levels. The terminals use stainless steel studs which resist corrosion. Exide Xtra comes with a 12 month free replacement warranty - one of the best in the industry. 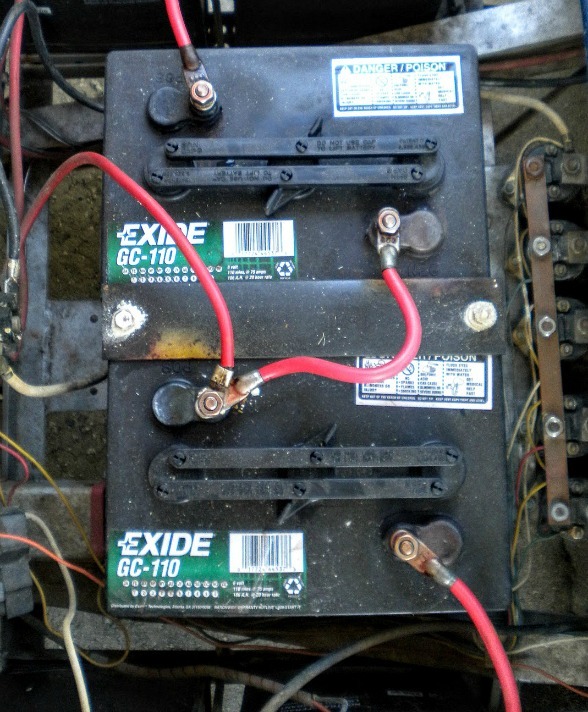 When it comes time to replace your electric golf cart batteries - be sure to replace all of them - not just one or two. Deep cycle batteries love to be evenly charged. So, if you have one "bad" battery and only replace it, the new battery will quickly drain to the level of charge as the old batteries. 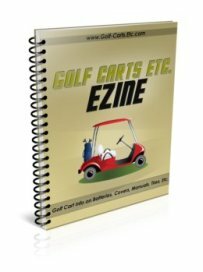 Golf cart battery resellers sell the Exide batteries in sets for this reason. Usually, the most economical way to buy golf cart batteries will be from a local golf cart dealer. "In operation, batteries generate and release flammable hydrogen gas. They must always be assumed to contain this gas which, if ignited by burning cigarette, naked flame or spark, may cause battery explosion with dispersion of casing fragments and corrosive liquid electrolyte. Carefully follow manufacturer's instructions for installation and service. Keep away all sources of gas ignition and do not allow metallic articles to simultaneously contact the negative and positive terminals of a battery." Maintaining your golf cart batteries is a necessary part of golf cart ownership. 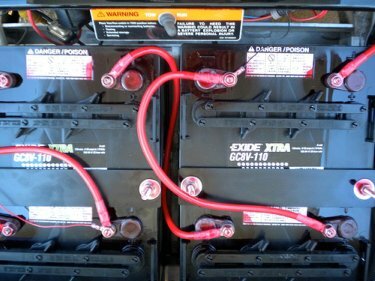 Keeping them free of corrosion as well as a regular watering program will extend the life of these deep cycle batteries. Safety is another important aspect of doing your own maintenance. The combination of gases and acid can make for a dangerous work situation.